Scooper - Technology News: Should the world worry about Britain leaving the EU? Should the world worry about Britain leaving the EU? Among the multiple existential challenges facing the European Union this year – refugees, populist politics, German-inspired austerity, government bankruptcy in Greece and perhaps Portugal – one crisis is well on its way to resolution. Britain will not vote to leave the EU. This confident prediction may seem to be contradicted by polls showing roughly 50% support for “Brexit” in the June referendum. And British public opinion may move even further in the “Out” direction for a while longer, as euroskeptics ridicule the “new deal” for Britain agreed at the EU summit on February 19. Nonetheless, it is probably time for the world to stop worrying. The politics and economics of the question virtually guarantee that British voters will back EU membership, even though this may not become apparent in public opinion polls until a few weeks, or even days, before the vote. To understand the dynamics that strongly favor an “In” vote, start with the politics. Until this month’s deal, Britain’s leaders were not seriously making the case against Brexit. After all, Prime Minister David Cameron and his government had to pretend that they would contemplate a breakup if the EU rejected their demands. Under these circumstances, it was impossible for either Labour politicians or business leaders to advocate an EU deal that Cameron himself was not yet ready to promote. The Out lobby therefore enjoyed a virtual monopoly of public attention. This situation may briefly persist, even though the EU deal has now been agreed, because Cameron has no wish to antagonize his party’s implacable euroskeptics until it is absolutely necessary; but as the referendum approaches, this political imbalance will abruptly reverse. One reason is Cameron’s decision to release his ministers from party discipline during the referendum campaign. Initially viewed as a sign of weakness, Cameron’s move has turned out to be a masterstroke. Having been offered the freedom to “vote your conscience” on the EU deal, most significant Conservative politicians – with the notable exceptions of Boris Johnson and Michael Gove – have come around to supporting Cameron. As a result, the Out campaign has been left effectively leaderless and has already split into two rival factions – one driven mainly by anti-immigrant and protectionist sentiment, the other determined to concentrate on neoliberal economics and free trade. It can be confidently predicted that as the political tide turns, the British media and business opinion will follow, mainly because of direct financial interests. For example, Rupert Murdoch, whose outlets dominate the media landscape, needs membership in the EU single market to consolidate his satellite TV businesses in Britain, Germany, and Italy. Another powerful motivator for Murdoch, as well as for other media proprietors and business leaders, is to be on the winning side and to maintain good relations with Cameron, unless they see overwhelming evidence that he will lose. That brings us to the main reason for ignoring current opinion polls: Only when Britain starts seriously debating the costs and benefits of leaving the EU – and this may not happen until a few weeks before the referendum – will voters realize that Brexit would mean huge economic costs for Britain and no political benefits whatsoever. The economic challenges of Brexit would be overwhelming. The Out campaign’s main economic argument – that Britain’s huge trade deficit is a secret weapon, because the EU would have more to lose than Britain from a breakdown in trade relations – is flatly wrong. Britain would need to negotiate access to the European single market for its service industries, whereas EU manufacturers would automatically enjoy virtually unlimited rights to sell whatever they wanted in Britain under global World Trade Organization rules. Margaret Thatcher was the first to realize that Britain’s specialization in services – not only finance, but also law, accountancy, media, architecture, pharmaceutical research and so on – makes membership in the EU single market critical. It makes little economic difference to Germany, France, or Italy whether Britain is an EU member or simply in the WTO. Britain would therefore need an EU association agreement, similar to those negotiated with Switzerland or Norway, the only two significant European economies outside the EU. From the EU’s perspective, the terms of any British deal would have to be at least as stringent as those in the existing association agreements. To grant easier terms would immediately force matching concessions to Switzerland and Norway. Worse still, any special favors for Britain would set a precedent and tempt other lukewarm EU members to make exit threats and demand renegotiation. Among the conditions accepted by Norway and Switzerland that the EU would surely regard as non-negotiable are four that completely negate the political objectives of Brexit. Norway and Switzerland must abide by all EU single market standards and regulations, without any say in their formulation. They agree to translate all relevant EU laws into their domestic legislation without consulting domestic voters. They contribute substantially to the EU budget. 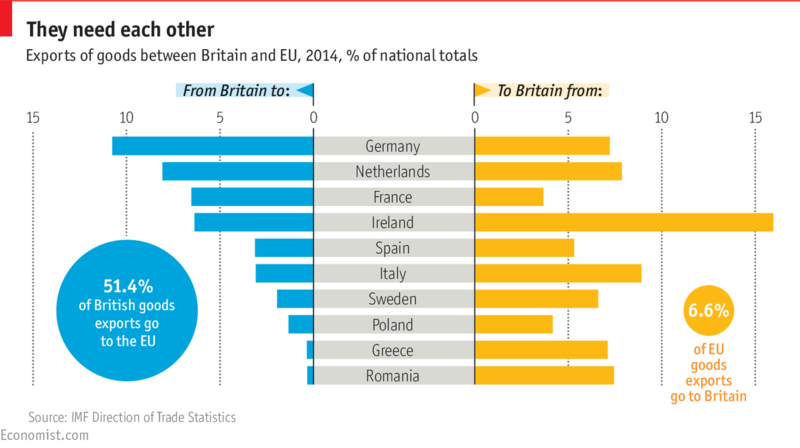 And they must accept unlimited EU immigration, resulting in a higher share of EU immigrants in the Swiss and Norwegian populations than in the UK. If Britain rejected these encroachments on national sovereignty, its service industries would be locked out of the single market. The French, German, and Irish governments would be particularly delighted to see UK-based banks and hedge funds shackled by EU regulations, and UK-based businesses involved in asset management, insurance, accountancy, law, and media forced to transfer their jobs, head offices, and tax payments to Paris, Frankfurt, or Dublin. When confronted with this exodus of high-value service jobs and businesses, Britain would surely balk and accept the intrusive regulations entailed by Swiss and Norwegian-style EU association agreements. Ultimately, Brexit would not only force a disruptive renegotiation of economic relations; it would also lead to a loss of political sovereignty for Britain. Or maybe just for England, given that Scotland would probably leave the UK and rejoin the EU, taking many of London’s service jobs to Edinburgh in the process. Once Britain’s political, business, and media leaders start drawing attention to these hard facts of life after Brexit, we can be confident that voters will decide to stay in the EU.